Imam An-Nawawi said the word Tahjeer means to be early for the prayer. The jurists have stipulated that in order to increase the reward, it has been recommended in the Sunnah to go to the Masjid walking and to avoid haste. The Shar’iah texts show the many merits in walking to the Masjid. The Prophet salAllahu ‘alayhi wa sallam said: When one of you enters the Masjid, do not sit until you pray two Rak’ah of prayer. Imam Ash-Shafi’ said: Tahiyaat Al-Masjid is legislated, even in the forbidden times. Also, Imam Al-Haafidh bin Hajar said: The people of Fatwaa [the scholars] agreed that Tahiyaat Al-Masjid is Sunnah. 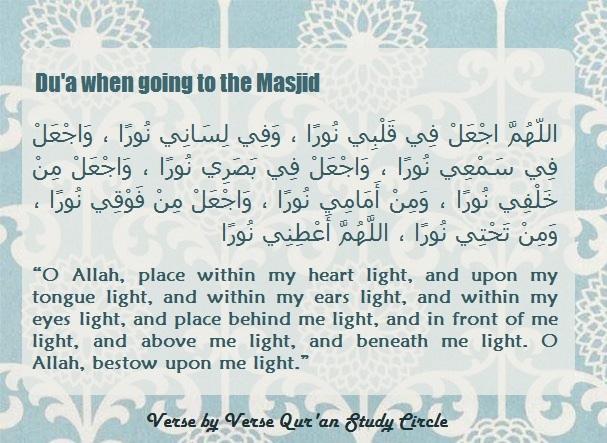 Also narrated by Abu Daw’oud, with the addition of sending salah on the Prophet salAllahu ‘alayhi wa sallam. Allah grant us the ability to act upon what has been said. Please note that since this is a free blog hosted on WordPress platform, we do not control the Ads that you see.